Wikileaks founder Julian Assange said the conviction of Bradley Manning on 20 out of 22 counts set a “dangerous precedent”. 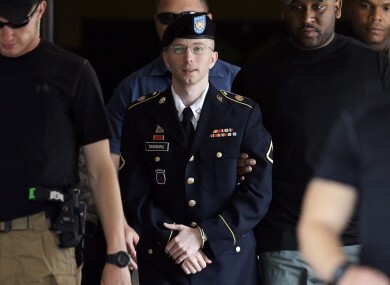 WIKILEAKS FOUNDER JULIAN Assange has condemned the trial and sentencing of US soldier Bradley Manning, saying the Army private was a whistleblower who committed a victimless crime. Assange said the conviction of the 25-year-old set a “dangerous precedent”, and pointed to the outcome of the leaking of military documents, which he said helped to expose war crimes and spark revolutions. “It is a short sighed judgment that cannot be tolerated and must be reversed,” said Assange in a statement. ”It can never be that conveying true information to the public is ‘espionage’. He said that it was was the first time a whistleblower had been convicted on espionage charges and criticised the tactics used by the military court. “The government kept Bradley Manning in a cage, stripped him naked and isolated him in order to crack him, an act formally condemned by the United Nations Special Rapporteur for torture,” Assange said. This was never a fair trial. Bradley Manning was last night found guilty of 20 out of 22 counts related to his leaking of hundreds of thousands of classified documents to anti-secrecy website WikiLeaks. He was found not guilty of the most serious charge of aiding the enemy, which would have carried a life sentence, but he could still face 136 years in jail if the judge decides to impose the maximum penalties on each charge. Julian Assange said there was no evidence that anyone had been harmed as a result of Manning’s disclosures. “The only ‘victim’ was the US government’s wounded pride, but the abuse of this fine young man was never the way to restore it,” he said. Deliberations will begin today on the length of Manning’s sentence. Email “Julian Assange: Bradley Manning didn't get a fair trial”. Feedback on “Julian Assange: Bradley Manning didn't get a fair trial”.